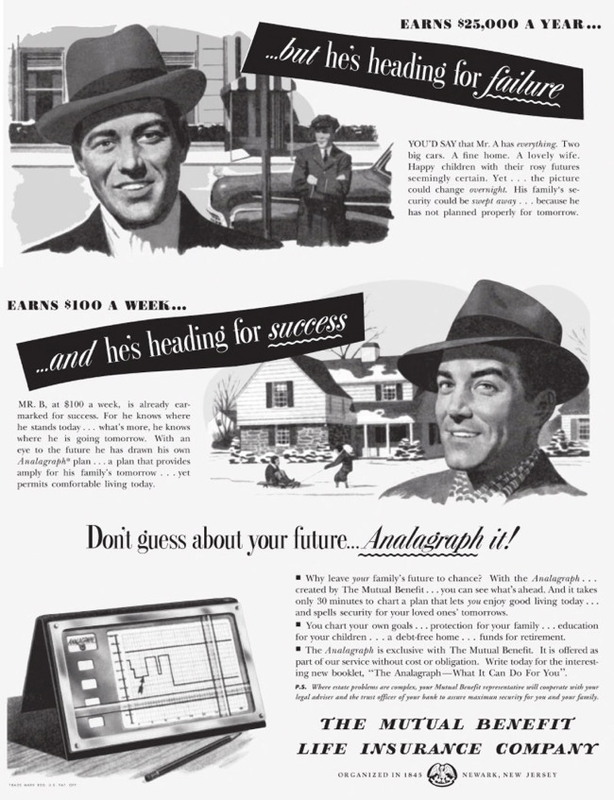 Don’t guess about your future… Analagraph it! 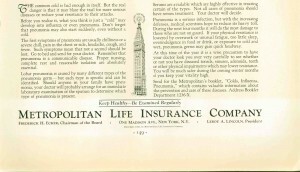 The Mutual Benefit Life Insurance Company marketed its electronic analagraph service from the late 1930s to the 1970s. 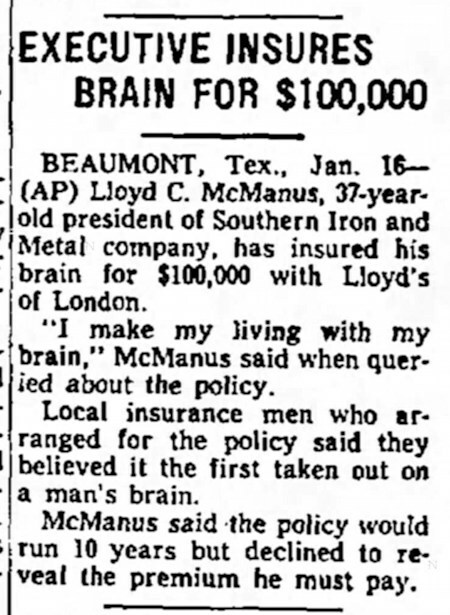 They described it as "a scientific device that lets you chart the family and its retirement needs." They even had an "analagraph school" in Newark, New Jersey where their employees would be sent to get trained as analagraphers. There are various methods for locating spinal subluxations. 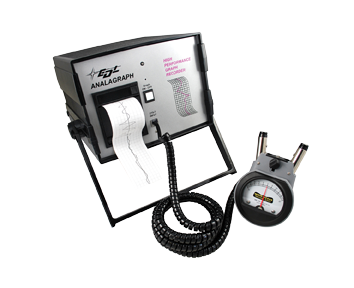 One of the most popular among chiropracters is the analagraph machine. This utilizes a thermocouple device which is passed over the skin all the way down the length of the spine. As the thermocouple passes each vertebra, it picks up any excessive heat readings and records them on a thin sheet of graph paper in the machine. All the doctor has to do is look at the graph paper and note any strong heat peaks. These are the areas where a subluxation is most likely to be present. 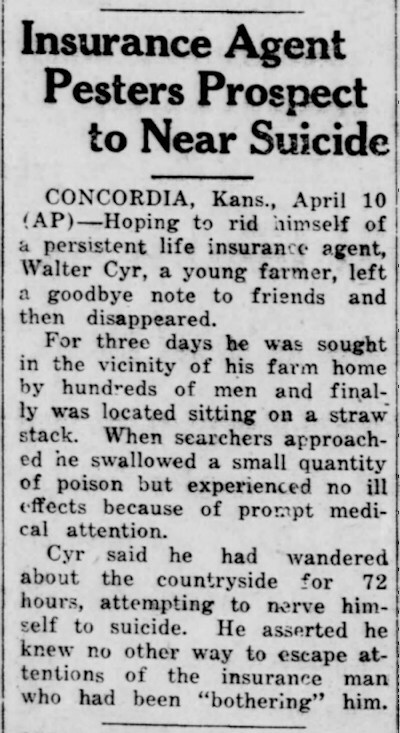 CONCORDIA, Kans., April 10 (AP) —Hoping to rid himself of a persistent life insurance agent, Walter Cyr, a young farmer, left a goodbye note to friends and then disappeared. For three days he was sought in the vicinity of his farm home by hundreds of men and finally was located sitting on a straw stack. When searchers approached he swallowed a small quantity of poison but experienced no ill effects because of prompt medical attention. Cyr said he had wandered about the countryside for 72 hours, attempting to nerve himself to suicide. 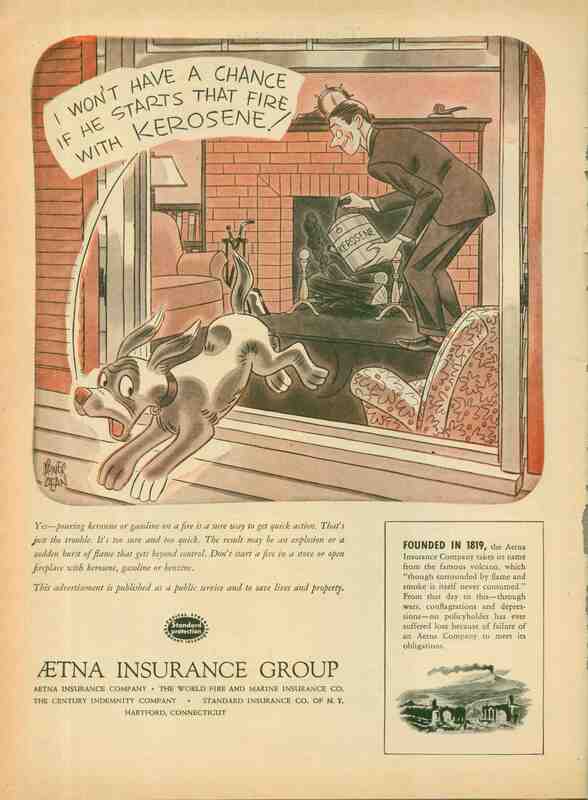 He asserted he knew no other way to escape attentions of the insurance man who had been "bothering" him. A Scottish cruise line felt the need to take out an unusual insurance policy. They are covered in the event that the Loch Ness Monster should damage one of their ships. That is sure to make their passengers feel so much more secure. 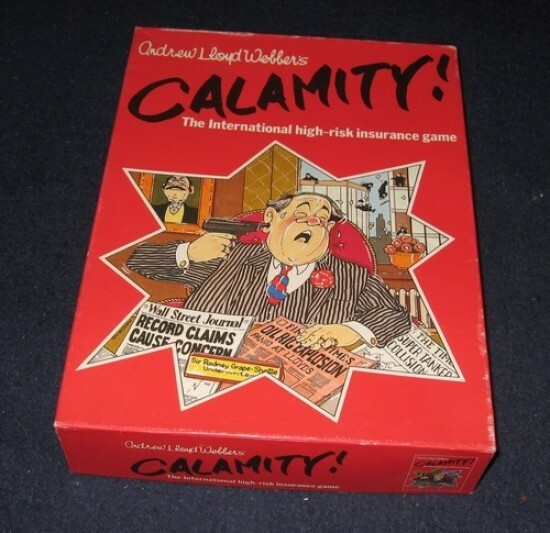 Gosh, this looks like a really not boring, laugh-a-minute game. And perfect for these economic times! Stick to your kitty cats, Andy! Yes, we believe our clients are dumber than a sack of troll dolls, and are not afraid to insult them to their faces. This illustration, by the way, comes from the great Abner Dean. 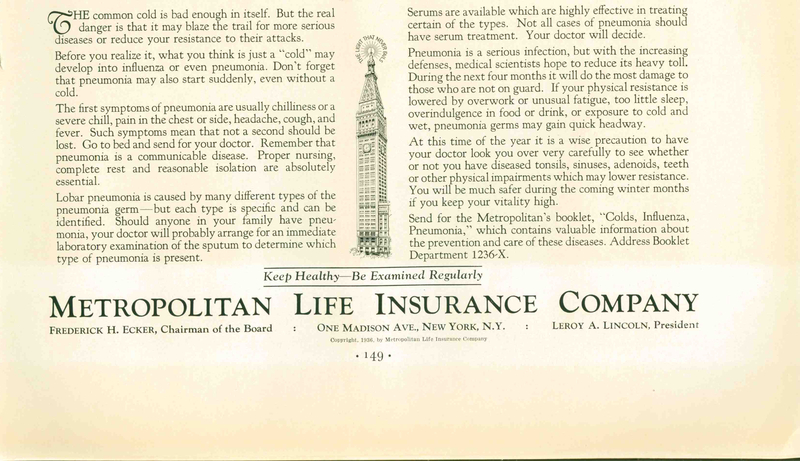 Not the most subtle or believable of Madison Avenue appeals. 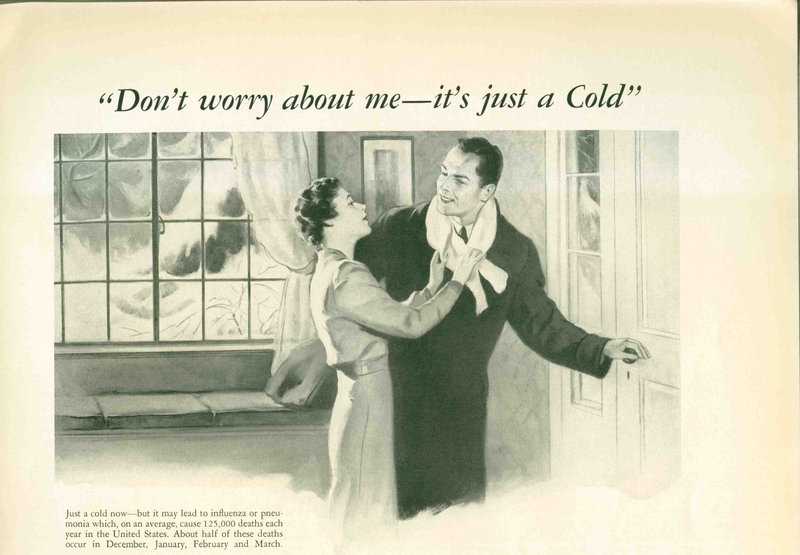 Sure, in that pre-antibiotic age, pneumonia was deadly. But I can't imagine that the proportion of cold-sufferers who contracted pneumonia--at least among the affluent audience for Fortune--was any higher then than it is today. In other words, miniscule.